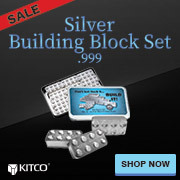 Selling Silver Britannia Coins is safe and easy with Kitco. The Royal Mint commemorates the 30th year since the official Britannia silver bullion coin design was first released in 1987. Sculptor Philip Nathan, the designer of the first Britannia silver coin, envisaged her as a classic and evolving icon. Britannia has a long history with Britain and its coinage, she is the embodiment of the nation she has represented for almost 2,000 years, ever since the Romans invaded the isles and claimed them as the province of Britannia. In this popular British silver bullion coin design, Britannia stands firm against a powerful gale which whips around her shield, donning a Corinthian helmet and olive branch. She first appeared on the Roman coins of Emperor Hadrian circa AD 119 and was revived for British coinage of Charles II in 1672. When Britannia Silver Coins were added to The Royal Mint’s Bullion portfolio in 1987, in response to a growing global bullion market demand, Philip Nathan created an interpretation of Britannia that was perfect for the new silver coins. He presented her with a strong maritime influence, standing windswept in a classical gown, waves at her feet; trident, shield and olive branch in hand – instantly recognizable in the international silver bullion coin market, the modern face of British Bullion and a symbol of strength and tradition. First struck in 1987, Silver Britannia Coins became an instant classic – today in 2017, it marks one of the flagship silver bullion coins produced by The Royal Mint. Philip Nathan’s craftsmanship reimagined an instantly recognizable icon. His Silver Britannia Coin design is commanding, powerful, yet feminine, peaceful, and elegant 30 years on. Silver Britannia bullion coins are renowned for their beauty and reliability, with their guaranteed silver bullion weight, fineness, and quality verified at the centuries-old annual Trial of the Pyx. The Royal Mint is a world leading silver coin mint, also producing the cupronickel circulation coins of the United Kingdom. The Royal Mint is also trusted with developing physical fiat currency notes and cupronickel coins for more than 60 nation states around the world, making it the world's leading export mint. Why sell Silver Britannia Coins to Kitco? Kitco is a trusted leader in the silver coin and physical precious metals industry. Silver bullion coins and other precious metals sold to Kitco are recognized in bullion markets around the world. With our focus on silver bullion, you can benefit from the competitive live Silver Britannia Coin price we offer within the silver bullion coin industry. At Kitco, we make it easy for you to manage your tangible wealth. The 1 oz Silver Britannia Coin(s) you sell and deliver to Kitco need not be in absolute mint condition. The Silver Britannia Coin(s) you sell us can be from a different year's mintage and their appearance may be slightly different from the Silver Britannia Coins illustrated here.